Come on, geeks. You know that you bandy about the term “Lovecraftian” just a little too much lately. It's almost as bad as when you sit in a Starbucks and listen to the hipsters talk about how “Kafkaesque” things are. It's getting to the point where the term has begun to lose its meaning. And that's a shame, because it's an evocative adjective that should carry with it some real power. I mean we're talking enormous inter-dimensional primeval horror here. But I don't have another adjective I can use to describe Black Fire. 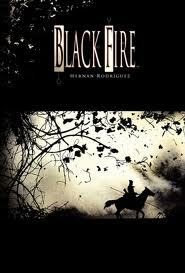 Black Fire is an Original Graphic Novel by Hernan Rodriguz and published by Archaia.. It is full of Lovecraftian horror. This is a story set during the French retreat from Russia during the Napoleonic War. It is about starvation and frostbite. It is about an abandoned snowbound village. It is about evil. It is about a Russian god of death, fire, and darkness. It is about creating a mood of dread, fear, and paranoia (if paranoia is, in fact, a mood). It is about the nightmare that occurs with the juxtaposition of human failures and the malevolent forces of the universe. Hernan Rodriguez has cobbled together an epic dark fantasy of Lovecraftian proportions (once again, what other adjective can I use). His expressionist style artwork marries muted colors with blasts of reds and oranges tightly contained in thick black ink, all of which propels the mood deeper and deeper into the horror that the plot unravels. His linework is perfect for the tone of this story, and he is most definitely an artist to keep an eye on in the future. My only problem with Black Fire was the fact that, as I was reading this grand tale, I kept having to back peddle to figure out who was who. And this was frustrating. Many of the characters look a little too much like each other, especially the ones with red beards, and I was having to rely too much on the exposition to connect the individual with their actions and motivations. This ended up having a watering down effect on the action, slowing down some of the more important scenes in the book. This is Rodriguez's failure as a sequential artist, but certainly one that he can overcome. Were it not for this unfortunately significant distraction, I would have given Black Fire a much higher rating. 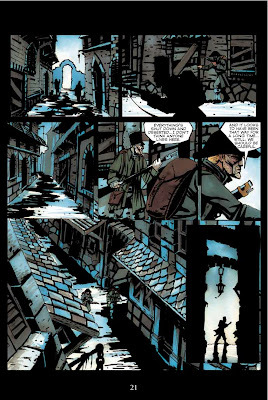 Still, if you are a fan of dark supernatural horror comics (notice I didn't Lovecraftian this time), this is probably a book you want to look at.